Picked this game up on a whim and pleased did as it is a lot more complex that it appears and offers a lot of strategic play and resource planning and manoeuvring. It is very much a game of long term plans and occasional risk taking through playing of cards to quickly alter others plans and possible change yours. We found most games last 45min-1hr and it makes for good option during a games club session. The basic premise is to finish with the most coloured blocks of your colour, and it is very much a long term strategy play style game. 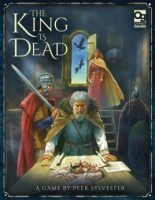 Add a Review for "The King is Dead"